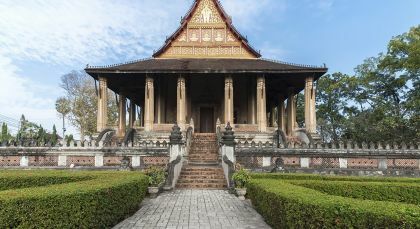 This new Laos itinerary allows you to venture through incredibly off-the-beaten-path small towns, which are brimming with authentic experiences! 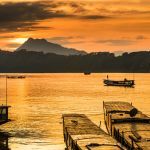 Rather than flying across Laos, this unique journey connects North and South Laos with stunning drives and a treasure trove of natural beauty. A completely private vacation, you can tailor this Laos trip to match your interests and preferences with recommendations from any one of our Asia destination experts! 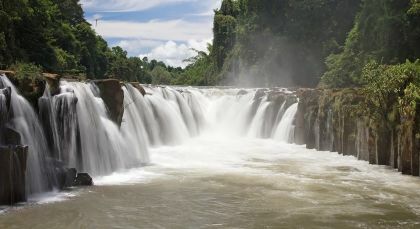 A 1hr drive southwards takes you to one of Luang Prabang’s most picturesque sights…Kuang Si Waterfall. En route halt at Phosy market…observe locals trading in fresh produce. Hike leisurely through the national park to Kuang Si Waterfall. Perhaps venture going up to the main waterfall and even swim in a large pool. Enjoy a picnic lunch before transferring by car to the Living Lands Organic Farm. 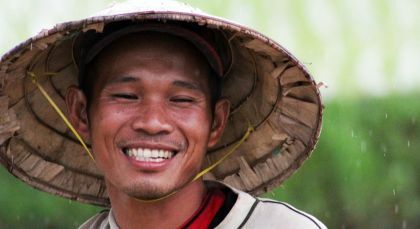 Here, meet up with a local farming guide, where you will be invited to interact and experience step-by-step the rice harvesting operation; see also how different tools are created. End with a tasting of traditional foods using rice. 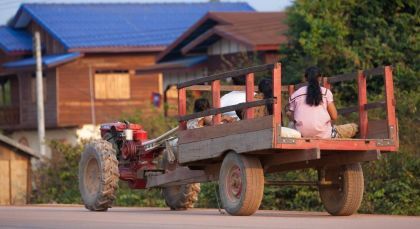 You will leave with a new appreciation for rice, and an admiration for the Lao people who yet continue to harvest rice without modern machinery. Return to your hotel by mid-day. 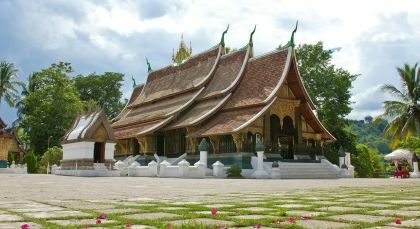 Meaning the ‘hills of paradise’, Phonsavan is the lively new capital of Xieng Khouang Province, Laos. Be fetched from your hotel by your guide at about 0800hrs and drive to Xiengkhuang, famous for the ‘Plain of Jars’. Follow a twisty mountain route before stopping at Ban Houi Hia with its panoramic mountain views. Continue further to Ban Kiu Kharm Pom, a Khmu village that you can explore before arriving in Phou Khoun for lunch. Continue the road journey into Xiengkhuang province, where you reach the highest altitude of the day – 1500m above sea level. With some extra time, make a stop at Ban Sonboun, a Hmong village. End the day with a visit to a hidden Buddha Cave that served as an army hospital during the Vietnam War. An optional stop can be to visit an old Russian tank. Arrive at the hotel by early evening. Visit the Mines Action Group (MAG) Office to discover the work of clearing remaining landmines and unexploded ordnance. 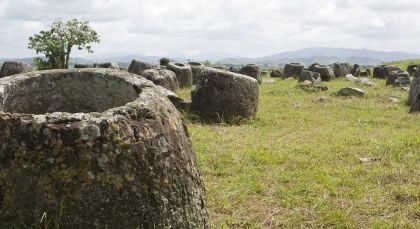 In the Plain of Jars around Phonsavan, just a short drive away, you can see centuries old, giant stone jars scattered around and part of prehistoric burial rites. A short trek from Jar Site 2 will take you to Jar site 3, which has more than 150 jars. This is located atop a hill and offers you a breathtaking view of the surrounding countryside! Before you return in the afternoon, visit Jar Site 1 – the largest with more than 300 jars! Picturesque and tranquil, Hin boun is located in the Khammouane district of central Laos, right in the heart of an eponymous nature reserve known for its natural wonders. 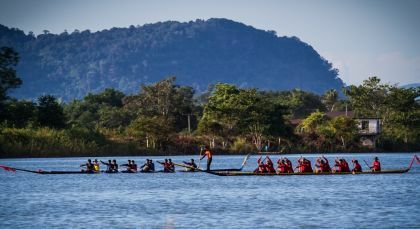 Thakhek is the capital of the Khammouane province in central Laos and is located on the banks of the mighty Mekong River that forms the boundary between Laos and Thailand. Explore mysterious caves! After a hearty breakfast, drive down to the Kong Lor village where you will find a private boat waiting to take you to the famous Kong Lor caves. Your guide will navigate you safely through the seven kilometer long cave, where you can stop to explore the spectacular stalagmite gallery on foot. Once you reach the other side of the cave, take a short walk to see the remote Ban Pom Ngam village. After you return through the cave, a car will drive you to Thakek. Arrive by late afternoon, just in time for a leisurely stroll where you can enjoy a stunning sunset over Mekong River. Start early in the morning from your accommodation in Thakhek for your drive to Savannakhet. En route, you will visit the Tham Pa Fa (Buddha Cave), which has 229 centuries-old bronze statues. Only rediscovered in April 2004, this incredibly picturesque cave sits high atop a limestone cliff and offers magnificent views of the surrounding landscape. Continue southwards on your journey to arrive at Savannakhet by lunchtime. In the afternoon, set forth to visit the old French Quarters and the sacred That Inhang Stupa, before checking into your hotel. You can spend the rest of your day at leisure. The city of Savannakhet in the eponymous Laotian province, is certainly a beautiful sight to behold! With a population of 120,000, this is the second largest urban settlement in Laos, after Vientiane. Really appreciate how everything is seamlessly arranged and choreographed – from the planning stage to the trip. Plus knowing that there is someone available 24/7 in case it is needed is very comforting.